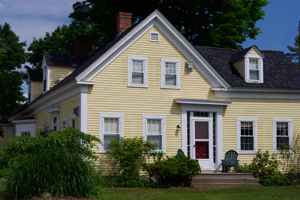 Welcome to The Sunny G Bed & Breakfast located in the picturesque upper Village of Campton, New Hampshire. At our 1811 farmhouse you’ll experience the charm of bygone times while surrounded by the comforts of today. Curl up with a book by the fire in our cozy living room while the scent of baking bread wafts in from the kitchen. Find a shady spot to relax on our lush 3 acres. Or go out for a day of hiking, biking, swimming, kayaking, skiing, or exploring in the White Mountains. Whether you’re looking for an active vacation outdoors, a romantic getaway, or a relaxing break from your hectic schedule, The Sunny G B&B has something to offer. We look forward to your stay.